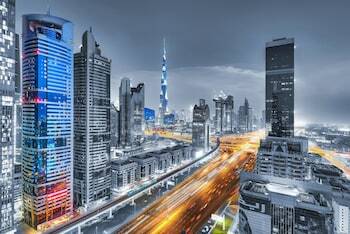 Property LocationWith a stay at Emirates Grand Hotel, you'll be centrally located in Dubai, within a 5-minute drive of Dubai World Trade Centre and Dubai International Financial Centre. 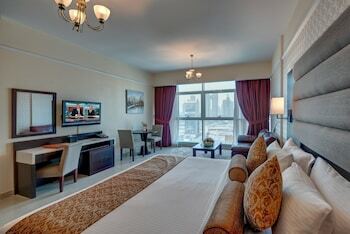 This 4-star hotel is 2.3 mi (3.8 km) from Dubai Mall and 2.7 mi (4.4 km) from Burj Khalifa.RoomsMake yourself at home in one of the 430 air-conditioned rooms featuring kitchens with full-sized refrigerators/freezers and ovens. Your Select Comfort bed comes with premium bedding. 32-inch flat-screen televisions with cable programming provide entertainment, while complimentary wireless Internet access keeps you connected. Conveniences include phones, as well as safes and desks.AmenitiesRelax at the full-service spa, where you can enjoy massages, body treatments, and facials. You can take advantage of recreational amenities such as a health club, an outdoor pool, and a sauna. Additional features at this hotel include complimentary wireless Internet access, concierge services, and babysitting/childcare (surcharge). Guests can get to nearby shops on the complimentary shuttle.DiningEnjoy Halal dishes at Lobby Lounge, one of the hotel's 2 restaurants, or stay in and take advantage of the 24-hour room service. Snacks are also available at the 2 coffee shops/cafés. Buffet breakfasts are available for a fee.Business, Other AmenitiesFeatured amenities include wired Internet access (surcharge), a business center, and complimentary newspapers in the lobby. A roundtrip airport shuttle is provided for a surcharge (available 24 hours), and free valet parking is available onsite. 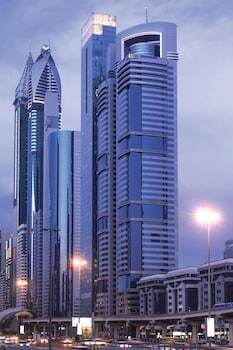 The one-stop site specializing in Dubai hotels and Dubai exclusive offers! Please note that alcohol is not served at this property. For more details, please contact the property using the information on the reservation confirmation received after booking.